It means slave. Bond-servant in some English translations, but the definition is pretty easy to capture. Slave. Property. Dependence on a master. This season has been the epitome of transitions. Instead of calling me to singleness, God’s giving me into marriage (Awww-frikkin’-YAY!). Instead of sending my life to the Middle East, He’s asking me to be content in the Midwest. Instead of guaranteeing a career that keeps me comfortable, I’m being asked to redefine comfort and press into trusting His sovereignty. 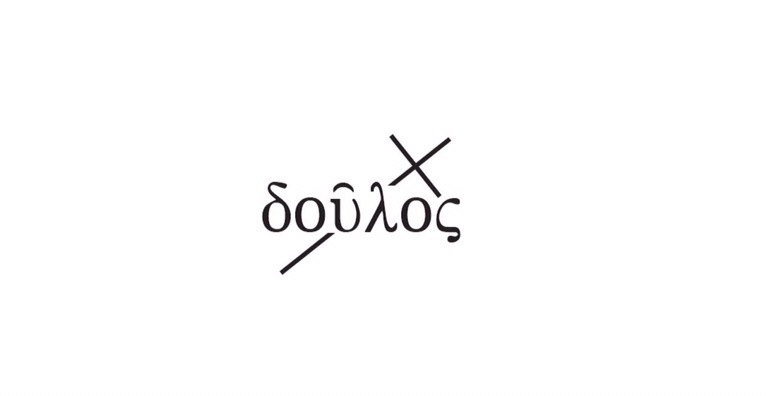 If you know me at all, δοῦλος (Doulos) isn’t me. Slave means trusting God’s goodness. I question it more than I want to admit. Property means I don’t belong to myself. Heaven knows I have enough narcissism in me that such an idea doesn’t sit easily with me. Dependent. Just by looking at the emotional strain in learning how to partially depend on another human is bad enough. Fully depending on an invisible, sovereign Deity? Yeah… Not me. Dependence is a choice, because of my sin-nature it’s rarely an immediate desire. The pictured design is getting tattooed on my dominant wrist. Because I’m a Sign Language dependent adult, I look at that wrist a lot. The tattoo gets to be an ever present (even when I don’t want it to be) reminder that I signed up for my faith to be so much more than just a word. I meant it to be an innate characteristic of my very being. I’m a servant who lives with Christ in the foreground. I’m His property, His creation, and yet He calls me His co-heir. His Beloved. He serves, therefore I serve. Even when the particulars scare me to death, frustrate me to tears or excite me to the point of anxiety… I choose to serve.